Is Alibaba Endangered by China's Slowing Economy? The e-commerce giant lowered its full-year estimates due to current macroeconomic conditions. Alibaba's (NYSE:BABA) annual Singles Day sales extravaganza on Nov. 11 saw a slowdown in growth despite hitting a record $30.8 billion in gross merchandise volume (GMV). Sales for the event grew 27% year over year in yuan terms, considerably less than the 39% growth it saw in the previous year. In fact, this was the slowest growth rate for Singles Day sales in the decade that the company has been promoting the event. This news came in the same month that the company reported that it was lowering its full-year revenue forecast to account for macroeconomic uncertainties. This leaves Alibaba investors wondering how worried they should be about the Chinese economy's setback. Let's take a closer look. Alibaba lowered its revenue estimates for the year to account for the slowing Chinese economy. Image source: Alibaba. 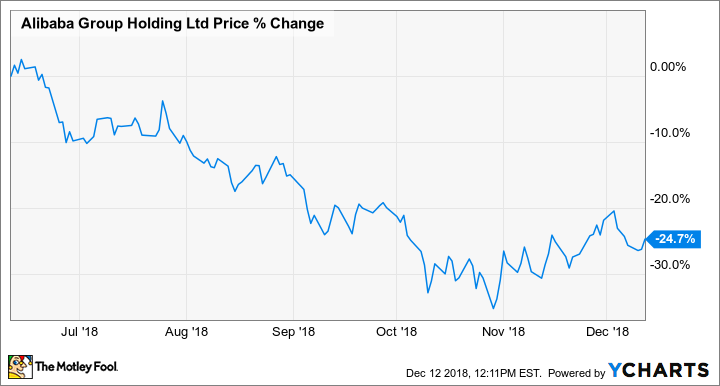 In the past six months, Alibaba shares have fallen about 25%, as investors question how current macroeconomic conditions will affect Alibaba's business. Right now, the country is embroiled in a trade war with the U.S., its stock market has had a meltdown, and its economy grew at its slowest pace since 2009 last quarter. Alibaba has not been immune. On Nov. 2, it reported quarterly revenue of $12.4 billion, which fell short of estimates. This was surprising because the company has made a habit of blowing estimates out of the water. In the same report, Alibaba lowered its revenue forecast by 4% to 6% in yuan terms for the financial year that ends in March. The downward revision of its revenue outlook reflects a decision "not to monetize, in the near term, incremental inventory generated from growing users and engagement on our China retail marketplaces." The company says this will benefit its merchants in the current challenging economic environment. It's nice to see a big company supporting the small-to-medium enterprises on its marketplace. But of course, Alibaba has a vested interest in keeping merchants happy on its platform. Right now, investors are worried that economic uncertainty is causing the middle class to tighten their purse strings. The latest retail data for China from July and August showed a drop in sales for big-ticket items, such as home appliances and autos, as well as for consumer electronics. With this type of data, it's natural for investors to wonder if Alibaba's e-commerce platforms might also see a dip in big-ticket sales. Alibaba Stock Performance, data by YCharts. Middle-class shoppers in China may not be buying as many larger items, but Alibaba says that's simply because their spending habits have changed. On its own China retail platforms, Alibaba says it has seen robust growth in sales of smaller items, such as consumer staples, cosmetics, and apparel. Another positive sign for Alibaba is that while China's economic report showed that online sales of goods were up 24% for the past quarter, Alibaba's own physical-goods GMV was up an impressive 30% from the year-ago period. Alibaba said this is a sign that it's still gaining market share in China. In addition, China is projected to add 850 million people to its middle class between 2009 and 2030, according to the Organization for Economic Cooperation and Development. These middle-class consumers are experiencing big wage increases, which will continue to give them more spending power. It's also important to realize that Alibaba is 19 years old at this point and has weathered two other dips in the global economy. Right now, the company's fundamentals are still good, so there's no reason it can't weather another dip. While Alibaba's third quarter revenue of $12.4 billion missed estimates, it still represented a stunning 54% increase from the year-ago period. In addition, net income rose 13% year over year last quarter, crushing analysts' estimates. Lastly, Alibaba has worked hard to ensure it has a long growth runway. Some of these opportunities are smaller, like a new partnership with luxury group Richemont to appeal to middle-class shoppers. But most important is the fact that Alibaba said it's working to digitize the whole China retail economy. That means using its data and technology to update brick-and-mortar stores so they can accept both online and offline orders. This digitization process is important because the long-term goal is to expand Alibaba's total addressable market (TAM) to the entire $5 trillion China retail market, rather than just the e-commerce retail segment. With that type of runway for growth, it's hard to imagine Alibaba being hurt too badly by a routine setback in the economy -- especially when it's already made it through two other similar setbacks. This is a time for Alibaba to prove that it can weather these storms.